Classified as endangered, the cheetah (Acinonyx jubatus) is the fastest land animal on earth. 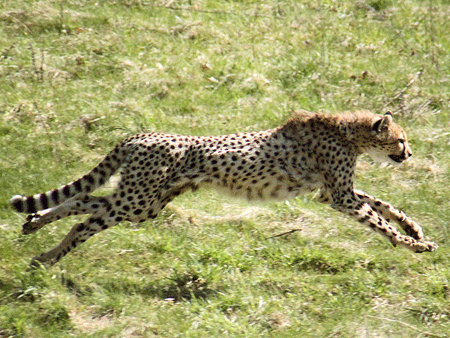 Capable of running up to 70 miles per hour, the cheetah’s slender, long-legged body with non-retracting claws and a uniquely shaped tail is built for speed. Its lovely spotted coat, small head and ears, and distinctive “tear stripes” from the corner of the eyes down the sides of the nose make the cheetah highly recognizable among the large cats of Africa. Due to things such as increasing loss of habitat, declines in prey, high cub mortality rates, and conflict with ranchers, a successful future for the cheetah is doubtful. The cheetah is one of animalpages.com’s favorites of all animal species. This entry was posted in Animal Facts, Animal Pix and tagged Animal Bytes, Animal Picture of the Day, Big Cats, Cats, Cheetahs by animalpages.Bookmark the permalink.